I found this sequence of Mike Schmitt from the Shredwell 2 days earlier this morning. If you bought the digital download you may recognize it from the set of wallpapers that came with it. Seeing this photo makes me want to revisit this spot and film something new on them this year. Be on the lookout for both SW2 as well as the new Turf video “Word Is Bond” coming out for free online. After nearly a year of anticipation, the day has finally come. 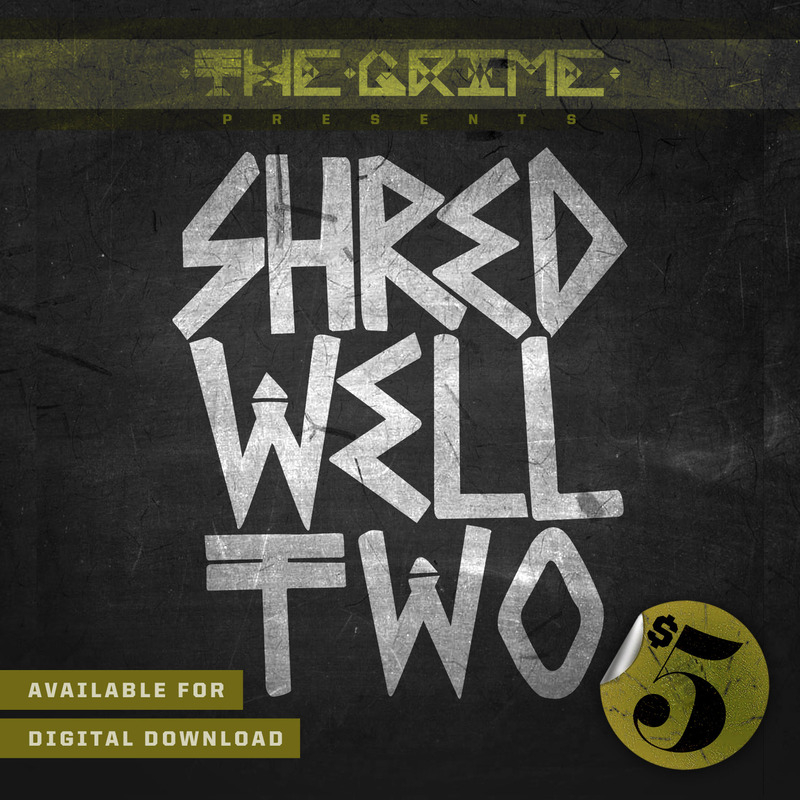 SHREDWELL2 is now available online for digital download. Help support the Fixed Freestyle scene and pick up a digital copy of the heaviest full length to date. We put a lot into this 38 minutes of mayhem & decided it was time to get this out of our hands and into yours. The video comes packed full of extras including exclusive photos of the team, and the never before seen “KRILLZWELL”. So stop what your doing, go dig though the couch and pick up yours HERE today. Here’s the official Introduction to SHREDWELL2. Consider this a Happy New year gift from Grime Bikes, Chrome Bags, and Wheel Talk. Enjoy. Shredwell2 is by far the biggest video project I’ve ever undergone. The amount of footage that we had to sift through, and chop together, would not have been possible without the help of my good friend Mike T Schmitt. Here’s a taste of the fruits of our labor. Ed Laforte, better known as “Wonka” recently moved back to NYC after living in San Jose, CA for a hot min. We spent most of the time he lived here filming for Shredwell2, a full length DVD we’ve been working on for nearly a year now. We’re hammering out some of the finer details and getting ready to get it out of our hands, and into yours. There’s going to be a premiere at the Chrome Store in Chicago on Dec 11th, if you’re in the area I suggest you go check it out. If you don’t already know, Mike Schmitt has been off his bike ever since we left Puerto Rico. I’m sure most of you have seen the horrifying pictures he’s been posting of his wound. Here’s a photo of him gapping out to feeble while we were on tour in LA (Los Angeles) filming for Shredwell2. Mike’s hubba game is unreal, I don’t know how he’s so calm hucking himself onto the things he does. His balls must weigh a ton. Steven Jensen enjoyed riding w/ us in Seattle so much that he decided to come back to the Bay Area w/ us to catch some last minute clips for Shredwell 2. Mike Schmitt and I filmed w/ him for a few days in San Francisco, while we worked on wrapping up editing SW2. I’m sure glad he came back w/ us, because he has some of the most technical clips in the video. Be sure to check out Jensen making a heavy appearance in the friends section of Shredwell 2. 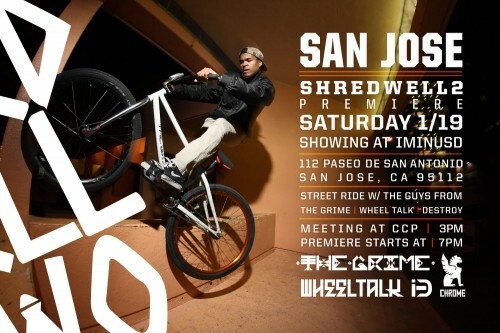 Here’s a couple screen shots I pulled from SHREDWELL2 of Mike Schmitt riding in down town San Jose. The dude standing next to him w/ the patch just wanted to come over and show the camera some love. The ledge leading into the Guadalupe River has to be the longest hubba I’ve ever seen anybody hit on fixed. Too many stairs to count, too locked in to care. Really digging that custom SW2 shirt he’s wearing.